Markets look set to start Tuesday where they left off the previous session -- slipping off recent record highs. U.S. stock futures were slightly weaker. "Following the excitement of the ECB and the Fed meetings earlier this month, we've quickly returned to a familiar pattern of low volatility and even lower volumes," wrote Deutsche Bank analyst Jim Reid, in a market report. Here are six things you need to know before the opening bell. 1. Oil prices ease: Oil prices are off nine-month highs. Radical Islamic militants continue to battle Iraqi forces but their territorial gains so far are limited to the north and west of Iraq, far from the main oil fields in the south. The price reduction will ease concerns about the risk to economic growth, although costlier energy remains a worry for big manufacturing economies -- Germany's Ifo index of business sentiment fell in June. "The German economy fears the potential impact of the crises in the Ukraine and Iraq," Ifo said. 2. Russian relief: The ruble and Moscow stock index were stronger, continuing their recovery from sharp losses earlier this year as fears about an escalation of the crisis in Ukraine fade. A ceasefire between government forces and pro-Russian separatists declared last Friday appears to be holding. Sentiment was also improving after Abbott Laboratories (ABT) said Monday it would buy Russian pharmaceutical company Veropharm for as much as $495 million, underlining the waning threat of sanctions. 3. Stocks to watch -- Walgreens, Avago: Walgreens (WAG) will post its quarterly earnings before the open. Shares in Avago Technologies (AVGO) were up 2.5% premarket after the Singapore-based chipmaker announced a $309 million cash acquisition of PLX Technology. 4. 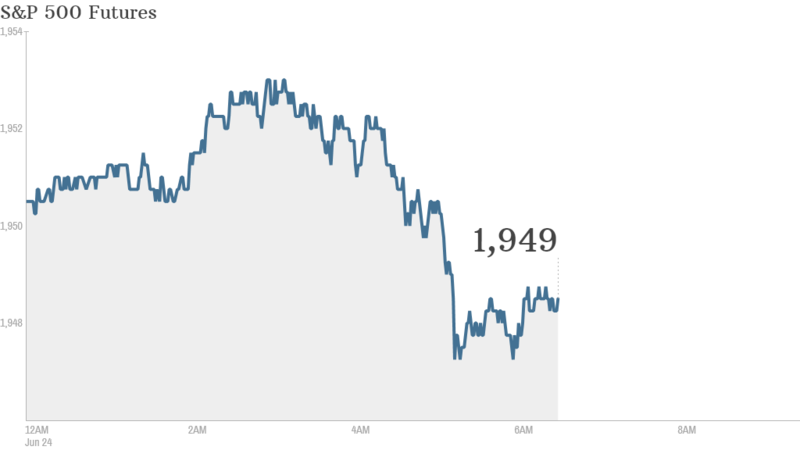 Data to watch: Investors will have some economic data to digest Tuesday morning. The S&P/Case-Shiller index measuring the value of residential real estate in 20 U.S. cities comes out at 9 a.m. ET. The U.S. government will post May data on new home sales at 10 a.m. and the Conference Board will release its monthly consumer confidence index, also at 10 a.m.
5. Japan reforms: Japan's government has released details on the third and final phase of Prime Minister Shinzo Abe's ambitious plan to jolt the country's economy out of stagnation. Companies may pay less tax as a result. 6. Market recap: U.S. stocks were mixed Monday. The Dow Jones Industrial Average closed fewer than 10 points lower, while the S&P 500 was down less than a point. According to Reid of Deutsche Bank, that was its second-lowest volume for a Monday this year. The Nasdaq eked out a gain, but barely. European markets were following suit with a mixed performance in midday trading. Asian markets ended generally firmer.